Some viewers may be surprised to find an article regarding wood in a predominantly metalworking website, as I was when the editor or the Model Engineers' Workshop suggested I provided an article on the subject for the magazine. After some thought though, I envisaged its use in a variety of workshop applications and, having done the obligatory DIY, I decided a few years ago that I would like to try some serious carpentry and from this I acquired some knowledge on the subject of timber. Where then will wood appear in the home metalworking workshop? Most obviously in the building itself as many will be a wooden shed also with wooden fittings. These will mostly be made using a "Softwood", frequently Pine. The term "Softwood" is though not what many will think it to be, but relates to the different cell structure between it and so called "Hardwood". These can be many and varied, typically, a plinth or display cabinet for a model. With an interest in making clock movements, making ones own case would add considerably to the satisfaction in the finished result. A piece of precision equipment, an engineer's level for example, would benefit from a well-made and polished hardwood box to house this, especially if being exhibited. 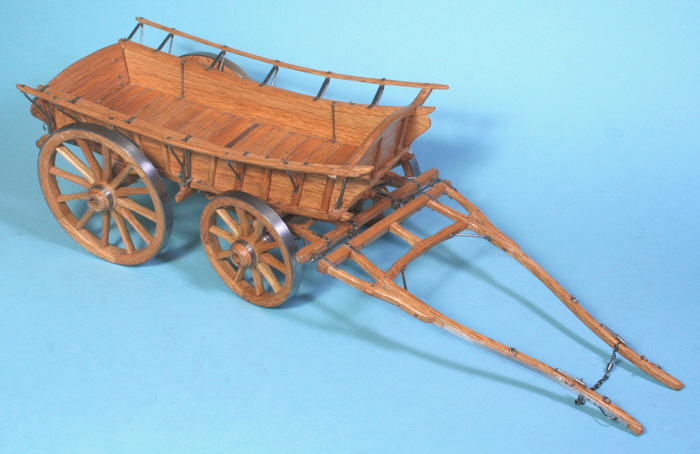 Many models made in the workshop will contain some timber, some a large amount, the "Monmouth" cart, Photo 1, being an example. Some have expressed an opinion that such models do not fit into the "model engineering" arena, there are though, whilst appearing mainly wood, 506 metal items not including the chain that was the only item I purchased. Before dealing with individual species, let us consider what happens between felling and arriving in your workshop. The obvious difference will be in the finish, sawn or planed. Whilst much "Softwood" will be planed, "Hardwood" will mostly be offered as sawn boards. For some species, this may still have the bark on either edge, called "Waney Edge". Even if supplied with sawn edges the widths will be random as, being an expensive commodity, the processor will not want to produce scrap in bringing all boards to a consistent width. For the enthusiast with mechanised planners this can add to the satisfaction as, until the board has been planed, its true appearance and its best location in the project cannot be chosen. If you purchase from a major supplier, sawn boards will be the only option. Smaller suppliers, of whom there are many, may be prepared to plane them to size for you, perhaps even having some planed boards on display from which you can make your selection. In these cases thickness will be to a standard size but widths will still be random. If like me you have a specific and less common requirement (American Red Elm in my case) buying from a large supplier may be the only option. Unless indicated otherwise the pictures can be clicked on to provide a larger view.